Find your limits and have fun at the same time. Boot Camp is one of our most heart pounding and exciting classes at Vermont Sport & Fitness. This class runs for 45 minutes with warm up and cool down included. Boot Camp is designed to test the limits of your fitness while keeping you injury free. This class is perfect for someone who wants to push themselves towards better cardio and strength performance while in a group atmosphere. 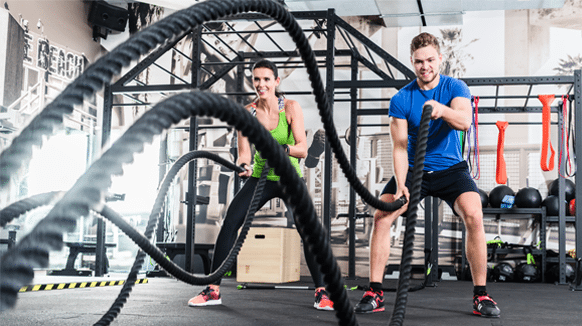 Boot Camp is 45 minutes of interval and agility training with use of battle ropes, kettle bells, slam balls, jump boxes and more. With professional trainers and experienced instructors leading the class, you are sure to get the results you are looking for. This class takes place in the North Wing of VS&F in our Strength and Conditioning room during the winter months. Once spring hits, we head to our outdoor class space with state of the art sound system and versatile terrain. The team spirit and encouraging atmosphere drives people to push themselves to get the most out of the class. Boot Camp will increase your overall fitness- core, stamina, balance, flexibility, toning and weight loss. This class will hit all the marks and keep you coming back for more.